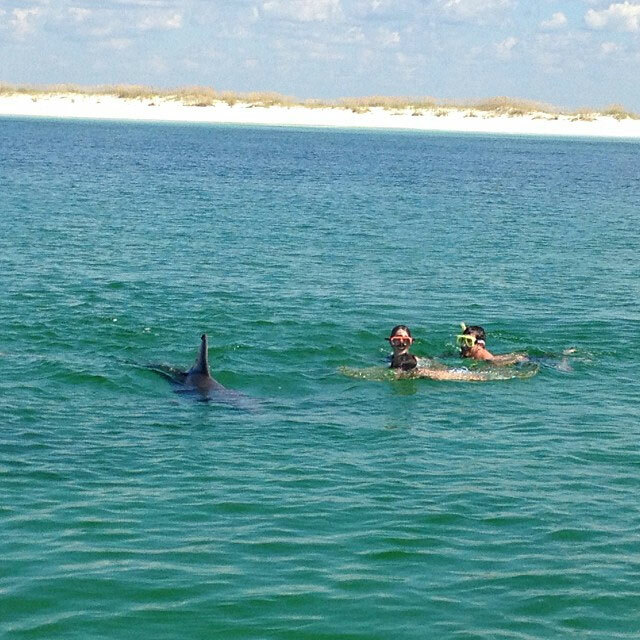 Swim with Panama City’s resident pod of wild bottle-nosed dolphins in their natural home on your trip aboard super-fast boats specially designed for finding and visiting with the dolphins. We are located in Panama City Beach and near Seaside, Rosemary Beach, Santa Rosa, Destin, Mexico Beach & Cape San Blas as well as all of 30A and Beaches of South Walton FL. 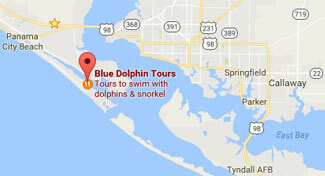 We’ll put you in the water before the dolphins arrive. That way, the dolphins are more likely to come to us rather than swim away. 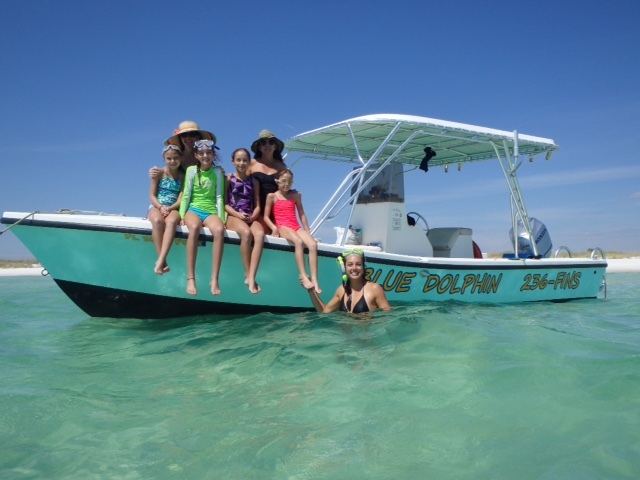 Unlike the larger tour boats that carry up to 150 people, Blue Dolphin Tours carries only 6 passengers (children included). We can have you in the water with your snorkel gear on quickly and without all the splashing and disruptions that large groups create, often frightening the dolphins away. We have 5 identical boats for larger groups, up to 30 persons limited to 6 per boat. Your captain will instruct you on the safest & best means of interacting with the dolphins. Snorkeling in our area can be world class. Enjoy watching birds of prey as well as the underwater world of SeaTurtles, Stingray, Seahorses, Starfish & Sand dollars. 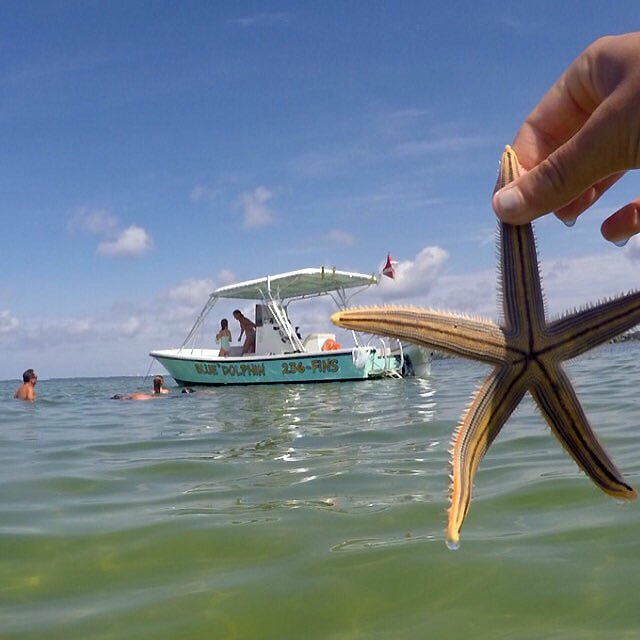 Exploring Shell Island, St Andrews Bay & the Gulf of Mexico is exciting and different every time you come. Snorkeling the grass flats and shallows of the island is for the whole family. We offer small group and personal tours for a customized wildlife adventure. This tour has it all! We are EXPERTS at family fun and have been doing this for over 30 years. Reserve your tour AT LEAST a few days in advance. If you plan on visiting during a holiday weekend, we recommend making reservations a week in advance.